Brassica oleracea is a plant species that includes many common foods as cultivars, including cabbage, broccoli, cauliflower, kale, Brussels sprouts, collard greens, savoy, kohlrabi, and gai lan. In its uncultivated form, it is called "wild cabbage,” and is native to coastal southern and western Europe. Its high tolerance for salt and lime, and its intolerance of competition from other plants typically restrict its natural occurrence to limestone sea cliffs, like the chalk cliffs on both sides of the English Channel, and the windswept coast on the western side of the Isle of Wight. Wild B. oleracea is a tall biennial plant that forms a stout rosette of large leaves in the first year. The leaves are fleshier and thicker than other Brassica species—an adaptation that helps it store water and nutrients in its difficult growing environment. In its second year, it uses the stored nutrients to produce a flower spike 1 to 2 metres (3–7 ft) tall with numerous yellow flowers. B. oleracea has become established as an important human food crop plant, used because of its large food reserves, which are stored over the winter in its leaves. It is rich in essential nutrients including vitamin C. A diet rich in cruciferous vegetables (e.g., cabbage, broccoli, cauliflower) is linked to a reduced risk of several human cancers. Researchers believe it has been cultivated for several thousand years, but its history as a domesticated plant is not clear before Greek and Roman times, when it was a well-established garden vegetable. Theophrastus mentions three kinds of rhaphanos (ῤάφανος): a curly-leaved, a smooth-leaved, and a wild-type. He reports the antipathy of the cabbage and the grape vine, for the ancients believed cabbages grown near grapes would impart their flavour to the wine. It has been bred into a wide range of cultivars, including cabbage, broccoli, cauliflower, brussels sprouts, collards, and kale, some of which are hardly recognisable as being members of the same genus, let alone species. The historical genus of Crucifera, meaning "cross-bearing" in reference to the four-petaled flowers, may be the only unifying feature beyond taste. 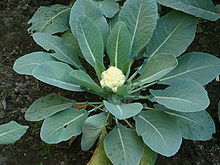 According to the Triangle of U theory, B. oleracea is very closely related to five other species of the genus Brassica. 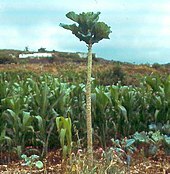 In places such as the Channel Islands and Canary Islands, where the frost is minimal and plants are thus freed from seasonality, some cultivars, known as Jersey cabbages, can grow up to 3 m tall. These "tree cabbages" yield fresh leaves throughout the year, are perennial, and do not need to be destroyed at harvest as with a normal cabbage. Their woody stalks are sometimes dried and made into walking sticks. With the advent of agriculture and the domestication of wild crop plants, the people of the northern Mediterranean began cultivating wild cabbage. Through artificial selection for various phenotype traits, the emergence of variations of the plant with drastic differences in looks took only a few thousand years. 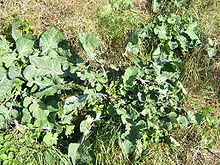 Preference for leaves, terminal bud, lateral bud, stem, and inflorescence resulted in selection of varieties of wild cabbage into the many forms known today. The preference for the eating of the leaves led to the selection of plants with larger leaves being harvested and their seeds planted for the next growth. Around the fifth century BC, the formation of what is now known as kale had developed. Preference led to further artificial selection of kale plants with more tightly bunched leaves, or terminal bud. Somewhere around the first century AD emerged the phenotype variation of B. oleracea known as cabbage. Phenotype selection preferences in Germany led kale down another evolutionary pathway. By selecting for fatter stems, the variant plant known as kohlrabi emerged around the first century AD. Further selection in Belgium in lateral bud led to Brussels sprouts in the 18th century. European preference emerged for eating immature buds, selection for inflorescence. By the 15th century AD, cauliflower had developed, leading also to the emergence of broccoli in Italy about 100 years later. The Lumbee tribe of North Carolina has traditionally used the leaves of B. oleracea in medicine that they believed to have cleansing qualities, as well as a mild laxative, an anti-inflammatory, and treatment for glaucoma and pneumonia. ^ Snogerup, Sven; Gustafsson, Mats; Bothmer, Roland Von (1990-01-01). "Brassica sect. Brassica (Brassicaceae) I. Taxonomy and Variation". Willdenowia. 19 (2): 271–365. JSTOR 3996645. ^ Verhoeven, D. T.; Goldbohm, R. A.; van Poppel, G.; Verhagen, H.; van den Brandt, P. A. (1996-09-01). "Epidemiological studies on brassica vegetables and cancer risk". Cancer Epidemiology, Biomarkers & Prevention. 5 (9): 733–748. ISSN 1055-9965. PMID 8877066. ^ Higdon, Jane V.; Delage, Barbara; Williams, David E.; Dashwood, Roderick H. (2007-03-01). "Cruciferous vegetables and human cancer risk: epidemiologic evidence and mechanistic basis". Pharmacological Research. 55 (3): 224–236. doi:10.1016/j.phrs.2007.01.009. ISSN 1043-6618. PMC 2737735. PMID 17317210. ^ Compare Theophrastus; raphanis (ραφανίς), "radish", also a Brassica. ^ Zohary, Daniel; Hopf, Maria; Weiss, Ehud (2012-03-01). Domestication of Plants in the Old World: The Origin and Spread of Domesticated Plants in Southwest Asia, Europe, and the Mediterranean Basin. OUP Oxford. p. 199. ISBN 9780199549061. ^ Theophrastus, Enquiry into Plants, IV.6.16; Deipnosophistae, I, noting the effects of cabbages on wine and wine-drinkers, also quotes Apollodorus of Carystus: "If they think that our calling it a rhaphanos, while you foreigners call it a krambê, makes any difference to us women!" (on-line English text). ^ Miller, Philip (1835). The Gardeners Dictionary. Volume 1 (9th ed.). p. 208. ^ Ayto, John (2012). The Diner's Dictionary: Word Origins of Food and Drink. Oxford University Press. p. 187. ISBN 9780199640249. ^ Osnas, Jeanne L. D. (2012-11-05). "The extraordinary diversity of Brassica oleracea". The Botanist in the Kitchen. Retrieved 2016-04-07. ^ "Vegetables - University of Saskatchewan". agbio.usask.ca. Archived from the original on 2016-03-29. Retrieved 2016-04-07.